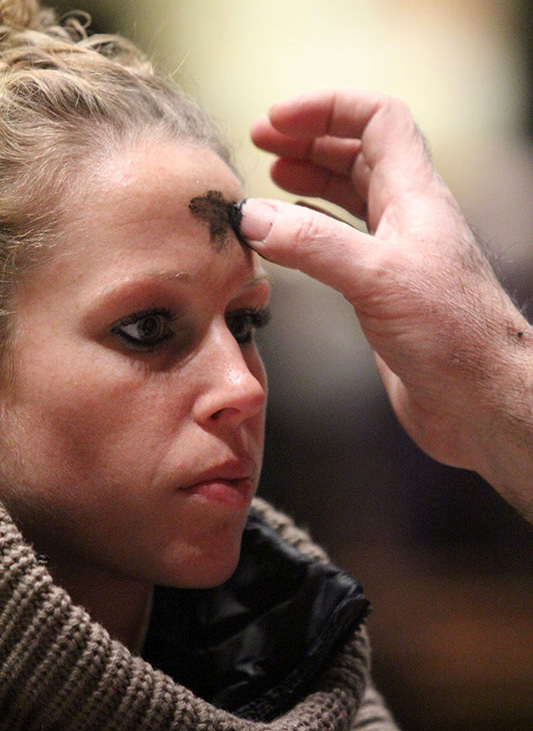 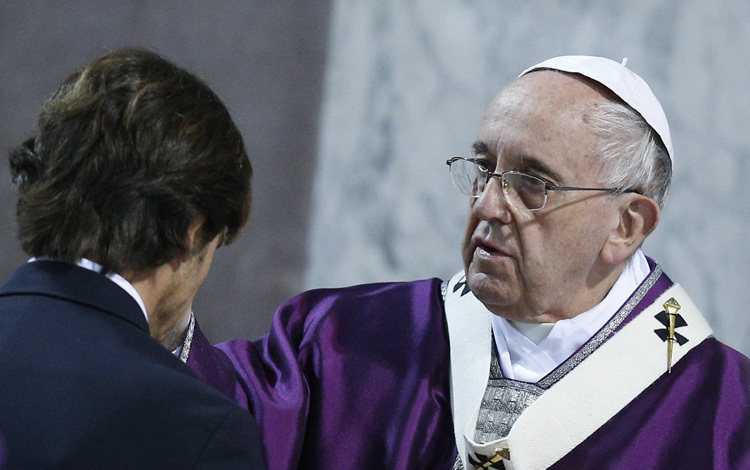 Ash Wednesday marked the beginning of Lent for Christians around the world. 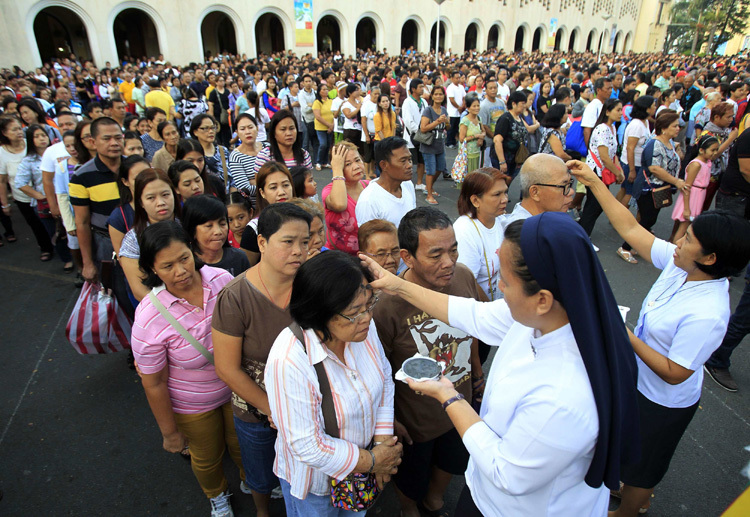 Pope Francis celebrated Mass at a basilica in Rome and sisters distributed ashes to thousands of Catholic outdoors in Manila, Philippines. 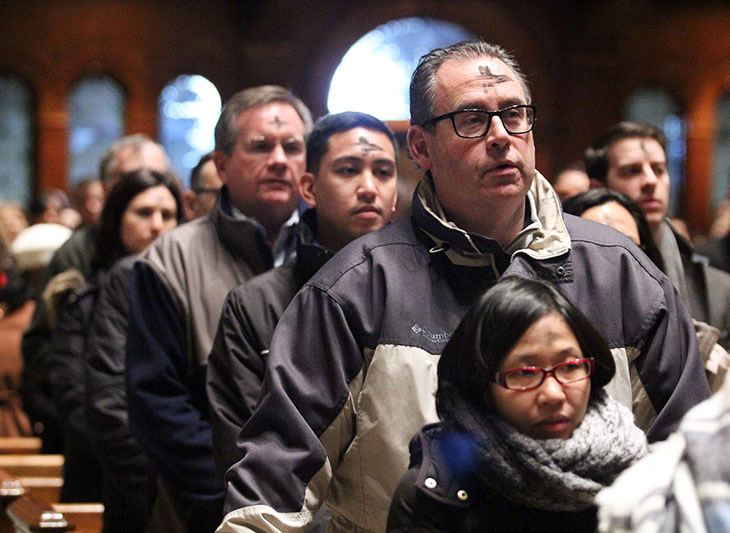 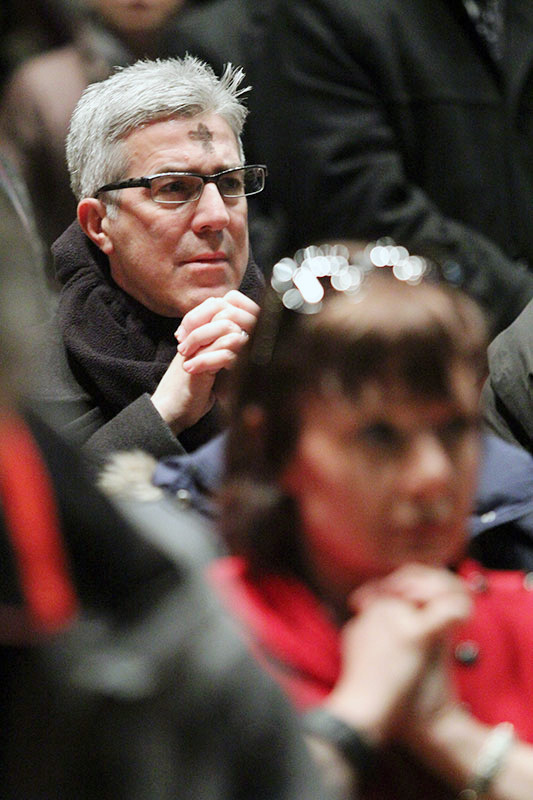 (Photos by Catholic News Service). 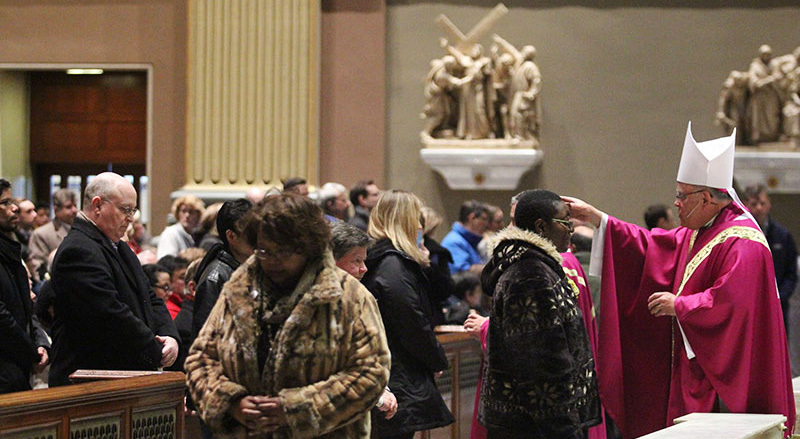 Archbishop Chaput prays the Collect prayer at the beginning of Mass. 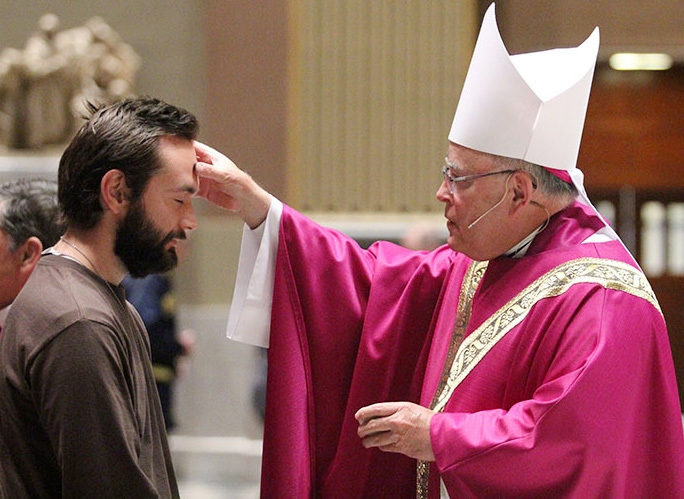 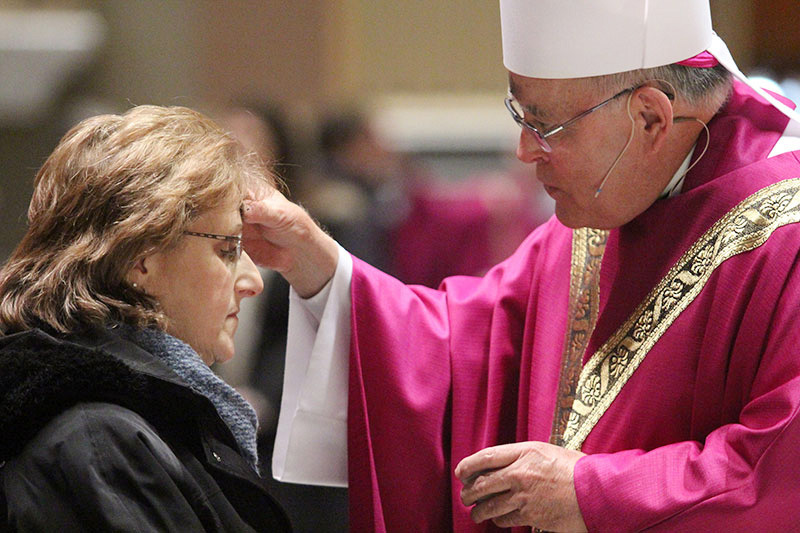 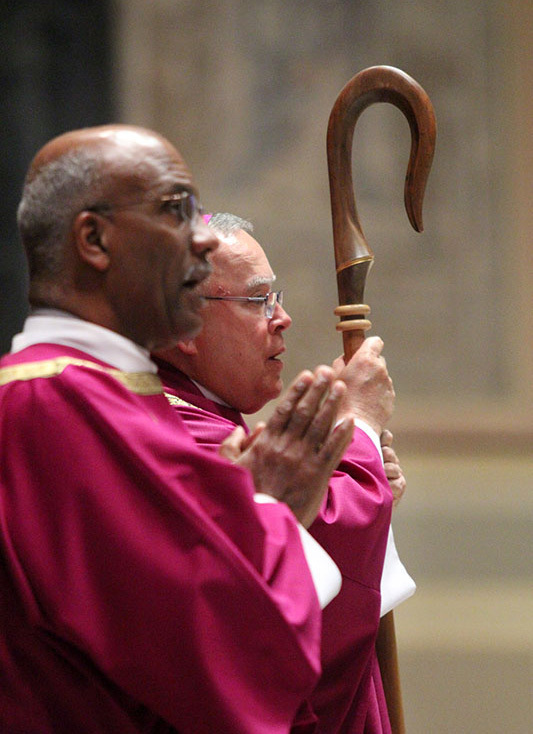 Deacon William Bradley (left) served during the Ash Wednesday Mass with Archbishop Chaput. 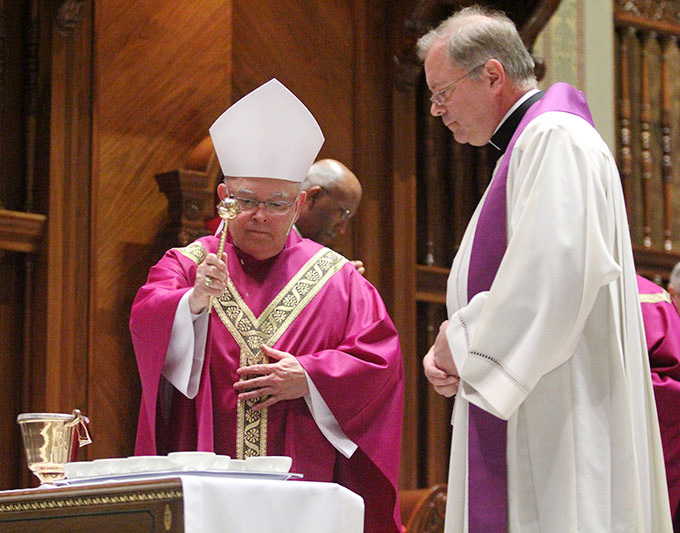 The archbishop blesses with holy water the cups of ashes to be distributed, as Father Dennis Gill, cathedral rector, assists. 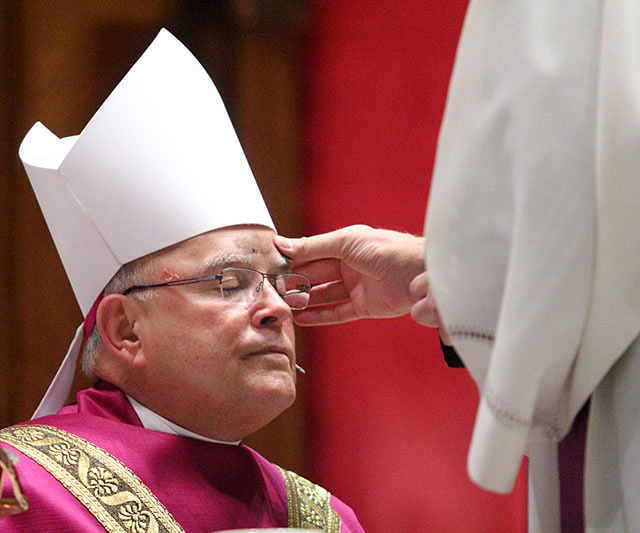 Father Dennis Gill makes the sign of the cross in ashes on the forehead of Archbishop Chaput, as he kneels. 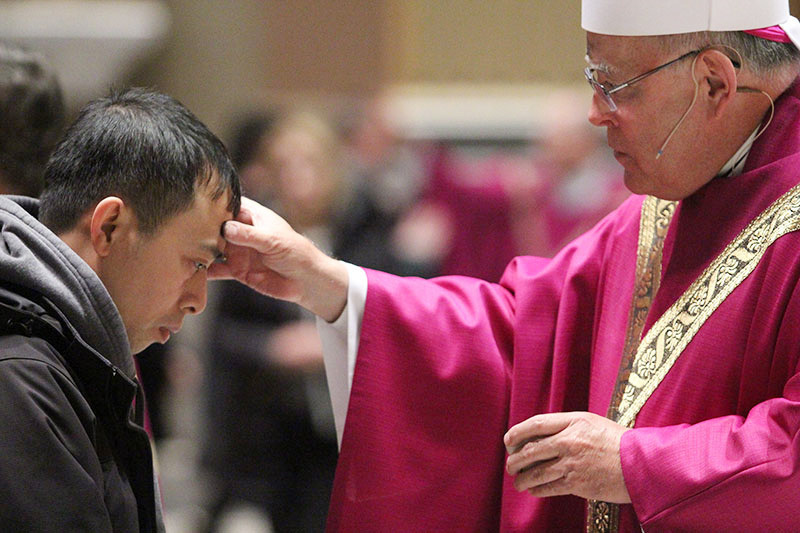 Archbishop Chaput distributes ashes to Kevin Griego from Santiago de Compostela Parish in Lake Forrest, Calif.
Archbishop Chaput distributes ashes to Hung Trin of St. Thomas Aquinas Parish in South Philadelphia. 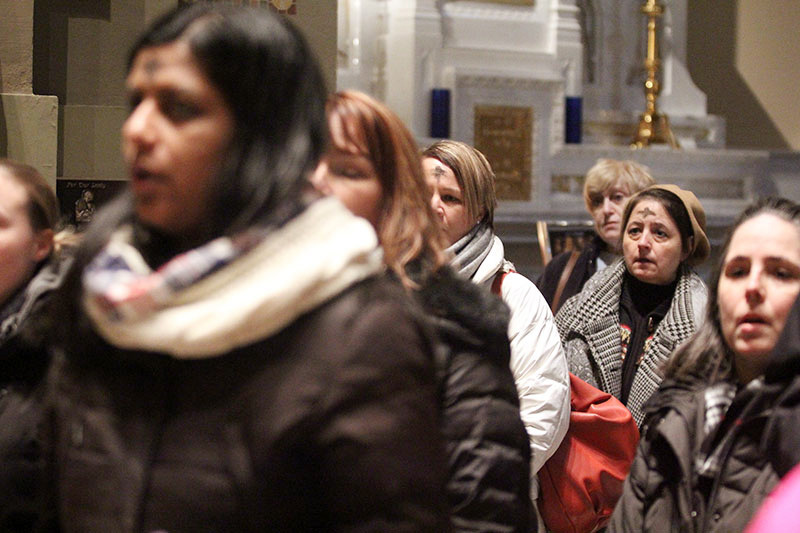 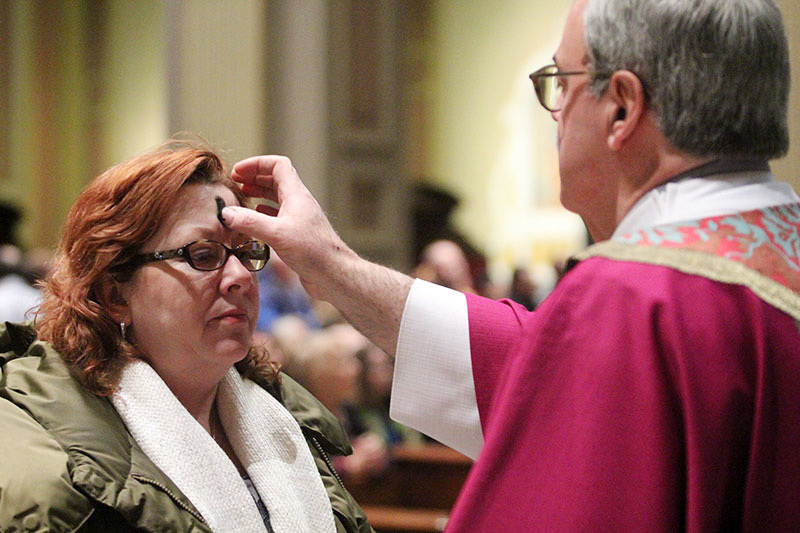 Amie Smyth, of St. Timothy Parish in Northeast Philadelphia, receives ashes at the cathedral. 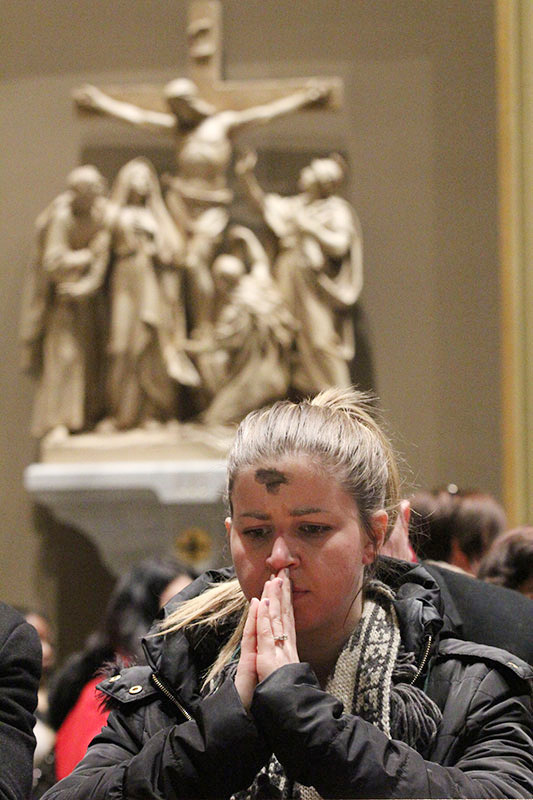 Heather Murphy, from St. Dominic Parish in Northeast Philadelphia, prays during Mass on Ash Wednesday, with an image of the cathedral’s stations of the cross in the background. 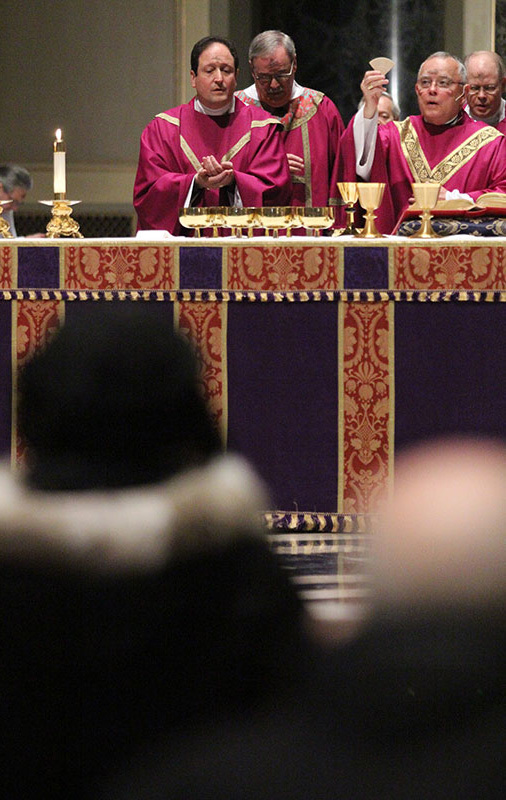 Joe Soprani, from St. Katherine Drexel Parish in Egg Harbor Township, N.J., prays during Ash Wednesday Mass at the cathedral. 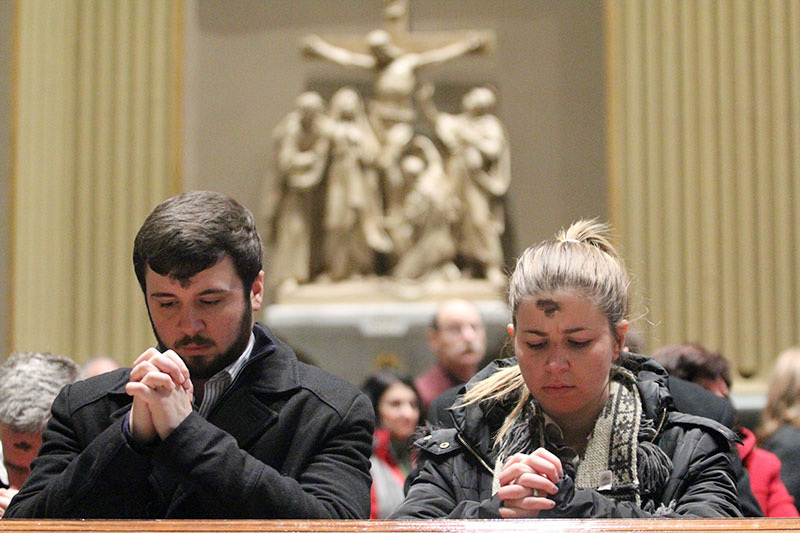 Engaged couple Jerry Ararewicz and Heather Murphy, from St. Dominic Parish in Northeast Philadelphia, pray together during Mass on Ash Wednesday. 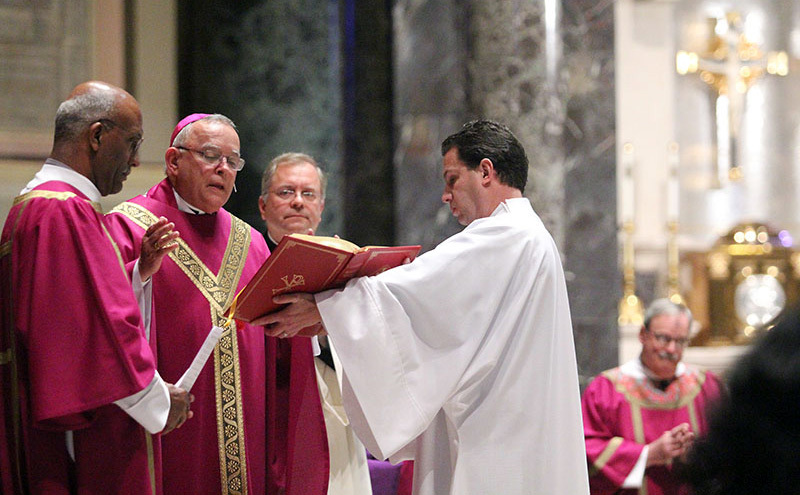 Robert Delbonifro, from the former St. Donato Parish in Philadelphia, receives ashes from Deacon Salvatore Bianco, a permanent deacon serving at St. Bridget Parish, Philadelphia. 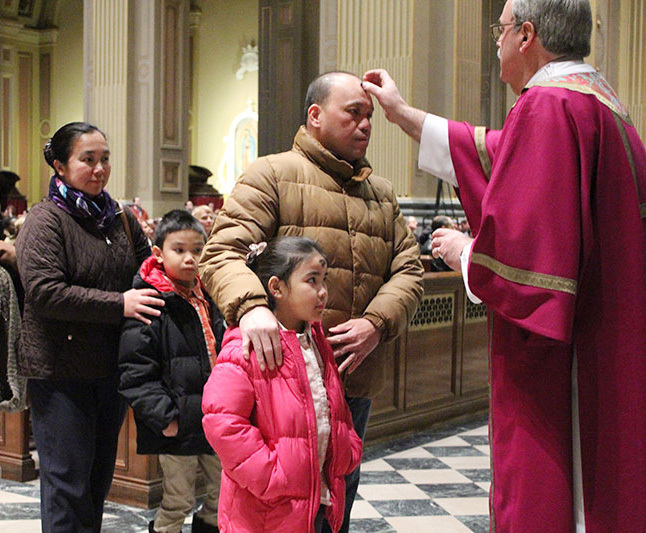 Deacon Bianco distributes ashes to Elpidio Deluna and his family, including daughter Shekinah (by his side), son Shiloh and wife Edith. 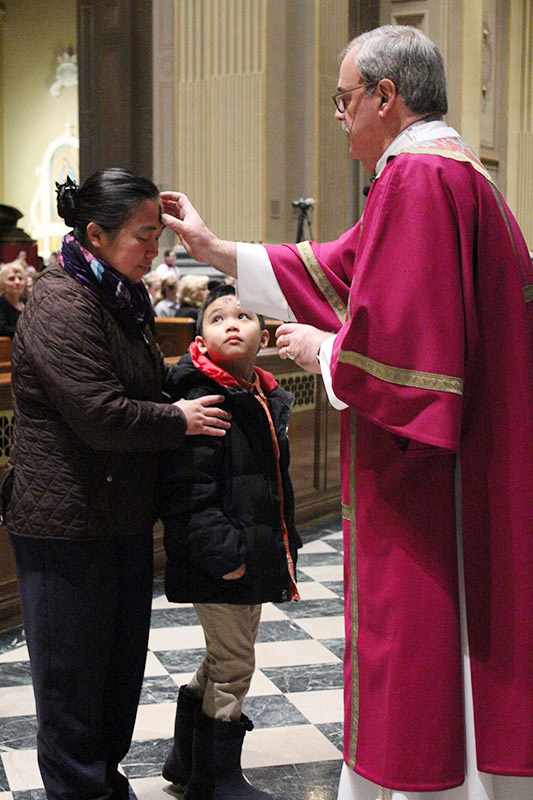 They are members of Our Lady of Sorrows-St. Anthony Parish in Hamilton, N.J., part of the Diocese of Trenton. 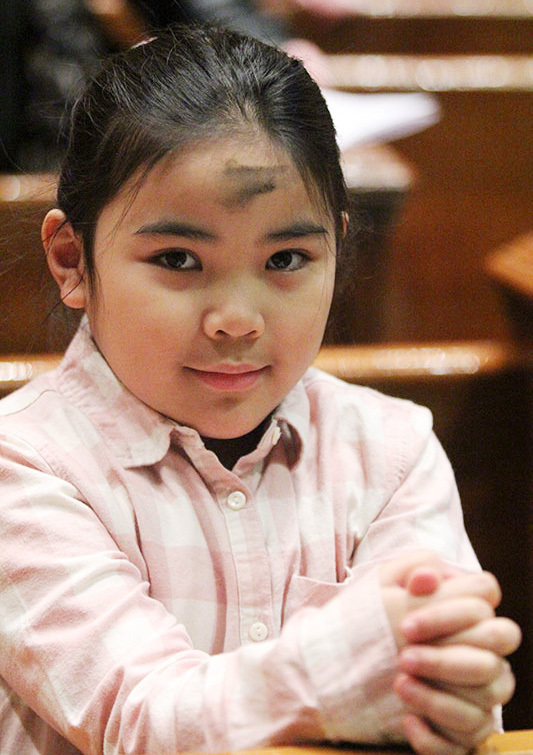 Young Shiloh Deluna watches his mother receive ashes on Ash Wednesday at the cathedral. 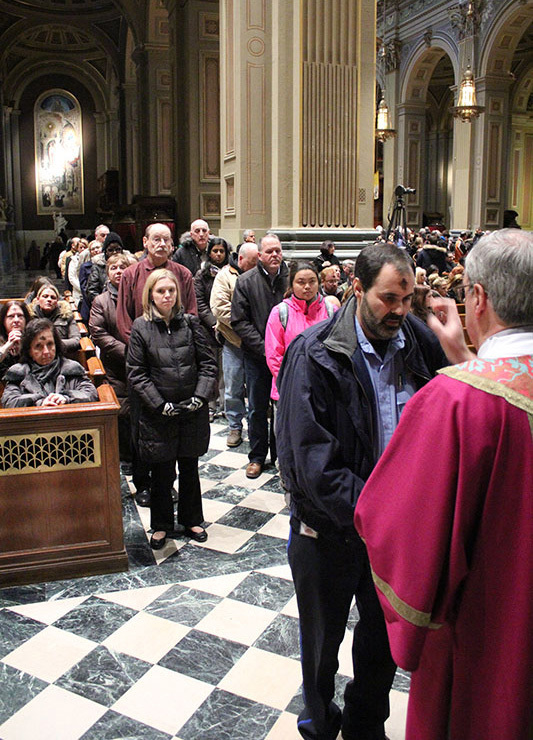 Janice Trout (second from right) attended Mass from St. Martha Parish in Northeast Philadelphia. 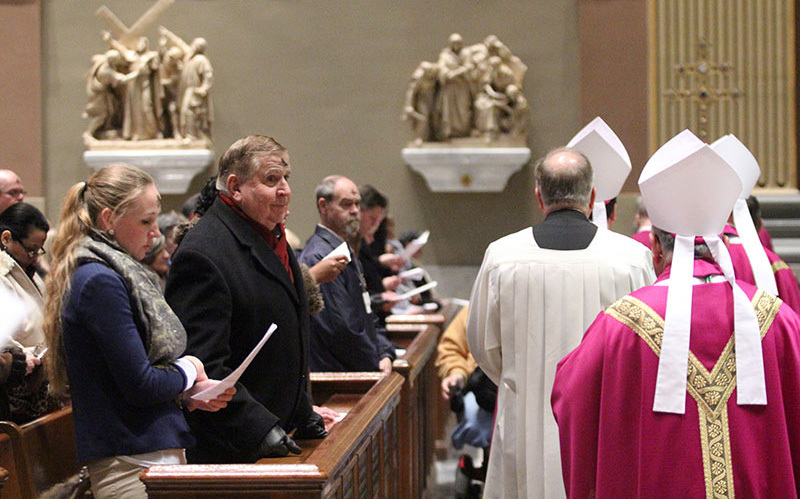 Ken Woodring from Our Lady Good Counsel Parish in Southampton prays with the congregation during Mass. 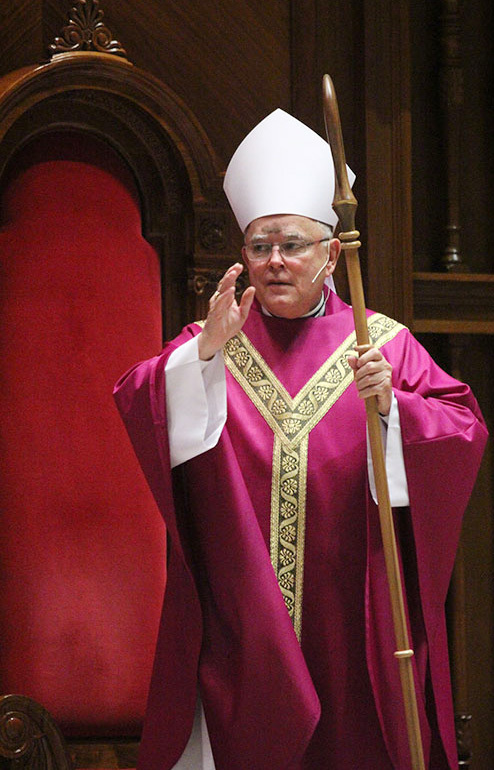 Auxiliary Bishop John McIntyre concelebrated the Mass with Archbishop Chaput, along with Auxiliary Bishop Michael Fitzgerald and other priest concelebrants. 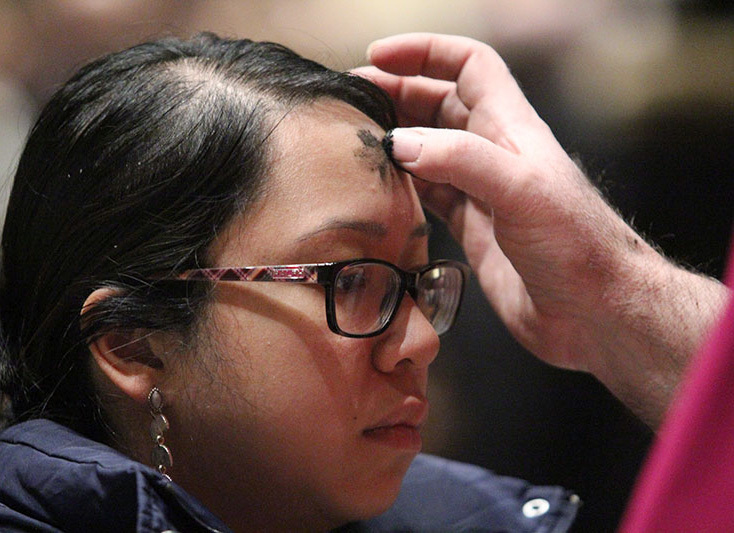 Shekinah Deluna from Hamilton, N.J.